On May 7 2018, Attorney General Jeff Sessions announced a “zero tolerance” policy towards illegal immigration. The new policy mandated that all cases of illegal crossing of the southern border be referred to the Department of Justice for prosecution. Sessions also required that undocumented children accompanying undocumented immigrants should be separated from their parents and held in separate areas. A month and a half later, the “zero tolerance” policy has generated some of the strongest political backlash against the Trump Administration to date, an impressive feat given the controversy of other policies and comments made by the Trump Administration. The policy has led to condemnation from a wide range of political figures, including Pope Francis, the United Nations, and Former First Lady Laura Bush. Protestors are barraging ICE offices and high ranking Department of Homeland Security employees. Sessions attempted to defend his policy by quoting the Bible, an action that resulted in an official complaint from his own church. Other Administration officers have defended the zero tolerance policy by claiming that President Obama had a similar policy and/or that they are waiting for Congress to provide guidance. Nevertheless, the political backlash forced the President to pull back on his Attorney General’s zero tolerance policy. On June 25th, Trump issued an executive order requiring that the Secretary of Homeland Security detain families together unless doing so would pose a threat to a child’s welfare. Notably, the Executive Order also directed the Attorney General to modify the Flores Agreement so that the Administration can detain families for the duration of criminal and/or immigration proceedings. The immigration crisis begs a number of questions: What is the Flores Agreement? What was the Obama Administration’s policy towards undocumented minors? Were there any alternatives to separating children from parents? In 1985, the ACLU file a lawsuit on behalf of a 15 year old asylum seeker from El Salvador named Jenny Flores. Federal authorities detained her, but refused to release her into the custody of her aunt. Flores was kept in a federal facility with unrelated adults and was often strip-searched. The ACLU argued that Flores had the right to be released to “responsible” adults like her aunt while waiting for the immigration courts to process her application. That detainment of minors be ended after 20 daysThere was some debate in 2014 as to whether the Flores settlement also applied to undocumented children who illegally crossed the border with their parents. A federal court ruled in 2016 that the Flores agreement applied to accompanied children as well as unaccompanied children. Although the Flores settlement was an agreement made by the Clinton Administration, it was somewhat codified into law by the 2008 Trafficking Victims Protection Act, which included a savings clause that enshrined the Flores settlement into existing immigration law. What was the Obama Administration’s Policy? One of the defenses to the zero tolerance policy is to claim that the Obama Administration did the same thing. It is true that the Obama administration attempted to lower the number of families seeking asylum by crossing the southern border. The Obama Administration wanted to keep families in detention and deport them as quickly as possible. As mentioned above though, a federal court ruled that the Flores settlement applied to accompanied children as well. That meant the federal government could not detain families for longer than twenty days if they had minor children with them. Sessions and the Trump Administration defers from the Obama Administration’s policy in two significant ways: First, Sessions supports separating minors from parents, a policy that the Obama Administration explicitly avoided by keeping children with their parents. Second, the Obama Administration complied with the Flores Agreement by releasing the entire family after 20 days of detention. Donald Trump signed an executive order that calls for the detainment of those families until their criminal and/or immigration cases have been resolved. Were There Any Alternatives to Separating Children from Parents? The Trump Administration has often insisted that it’s just enforcing existing law. To be sure, deportation is always an answer in immigration law. Session’s zero tolerance policy would subject all illegal immigrants to prosecution under criminal law. However, as any District Attorney would attest to, not all crimes are prosecuted to the full extent of the law. In executing the law, District Attorneys have to weigh the benefits to society and the associated costs. Zero tolerance for illegal immigration is a policy that imposes a greater burden on the federal government than any benefits it would entail. Improper entry is a crime under 18 U.S.C.A. § 3559, but it’s not a crime that requires drastic action. First time offenders are only misdemeanors and only subject to a fine and/or imprisonment for six months. The fine is to be between $50 and $250. Repeat offenders can be fined and/or imprisoned for up to two years. 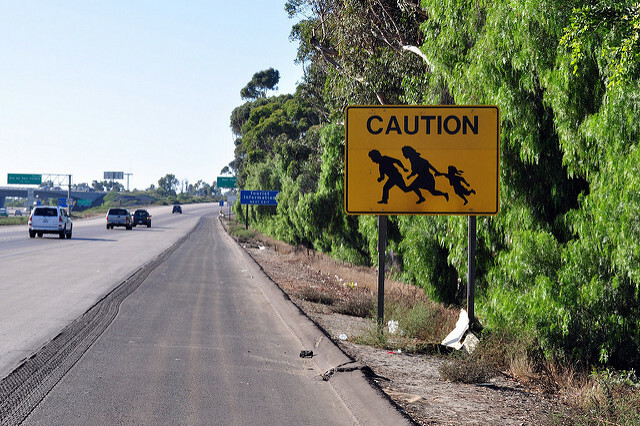 First time illegal immigration is pretty much a federal equivalent of a traffic ticket. Federal law treats repeat illegal immigration as a low-level felony. The fine is to be between $100 and $500. Repeat offenders are treated more seriously, but there are federal laws with more severe penalties. Although improper entry into the United States is a crime, there are also plenty of exemptions and exceptions. Refugee status and asylum are among the exceptions and exemptions that those accused of improper entry can argue. Notably, current law gives prosecutors and judges discretion in punishing offenders. Prison is an option, but the level of the offense indicates that fines would be more appropriate. In most cases, fines will be the more appropriate punishment. Imprisonment requires that the state expends resources to house an illegal immigrant, which is exactly the sort of expense that federal government wants to avoid by denying entry to an immigrant who improperly enters the country. Comparatively, the costs of a zero tolerance policy for illegal immigration are staggering. Such a policy would overwhelm the judiciary, as the Trump administration is discovering. Prosecuting every instance of improper entry has significantly slowed the immigration system down, as there are not enough prosecutors and judges to process everyone in a speedy manner. It has also resulted in major civil rights abuses. Separation of children is a significant problem, but ICE raids have led to Fourth Amendment abuses as well. Although Sessions would like to pretend there are no options other than separation of children, the Obama Administration has proven that there are alternatives. “Catch and release” is one option, and it can be more effective than Sessions might believe. Many American citizens are accused of crimes every day, but not all of them sit in jail. Bail bonds and GPS devices are usually enough to ensure they appear in court. In fact, they would be even more effective on illegal immigrants than regular criminal defendants. The latter are often trying to flee the country to avoid being arrested again by the state. The federal government would have no such problems with illegal immigrants.